Run Technology® compression socks feature graduated compression and great looking designs. Socrates® socks provide wisdom for your feet, body and soul. Every runner knows that, when it comes to comfort and performance, it's all about the feet. Gone For A Run has runner's footwear appropriate for every waking hour that will keep a smile on your face no matter how far you've traveled today. Taking care of your feet during and after a run will help you perform better, recover faster and be less prone to fatigue-related accidents and injuries. We have been supporting elite athletes and casual enthusiasts since 2010 with runner's footwear that is as stylish as it is practical. 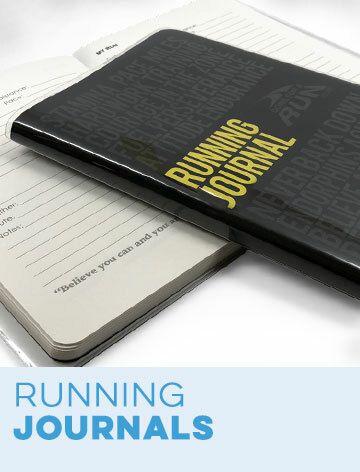 Order today so you'll ready for your next 20-mile training run or for doing errands on a recovery day. Our running sandals and socks feature leading designs from our knowledgeable staff. Runner's socks can make as big a difference for runners as the sneakers they're in, and we're happy to assist you in finding the right pair for your tootsies. We carry woven performance ankle socks with woven inspirational messages, elastic top knee socks with fun original patterns and multicolored compression socks that provide support and promote blood flow. All of our athletic socks are made of moisture-wicking fabric to keep your feet cool and dry. When you've returned from a great run, reward yourself by kicking back in cozy slipper socks line with warm Sherpa fleece. Recovery is an often-underrated part of a runner's life, and you can accelerate the process with our PR SOLES® recovery sandals and flip flops. First introduced in 2013, our revolutionary slide sandals have soles that massage as you walk, relieving tension and soreness in your feet, legs and back so you're quickly refreshed for the next run. We also have waterproof custom flip flops for relaxing by the pool. Quality men's and women's running footwear is vital gear for anyone involved in the sport, and when given as a gift, is a sure way to show a runner you care about them. 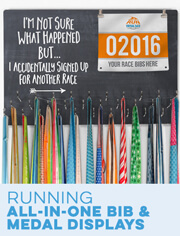 Gone For A Run has free shipping on qualifying orders to go with our great prices. Runners rely on their feet more than anything to achieve success in the sport - so what’s more important than footwear? Whether it’s a pair of our PR SOLES® Recovery Sandals with an ACUPOINT® cushioned footbed to soothe and massage tired and sore feet after a run, moisture-wicking socks in ankle, mid-calf, or knee lengths, with unique patterns and designs (including personalized socks with your own text), or even stylish everyday running sandals or flip flops - we have the perfect footwear for a runner to show off after a run, while running, or on a casual day when out with friends or running errands. With a choice of slide-on sandals or flip flops, our PR SOLES® recovery sandals are the perfect sandal to change into after a long run or a race with ACUPOINT® soles that massage feet by rubbing against trigger points on the soles of the feet to soothe tired and sore feet, as well as to help reduce pain in the legs and lower back. The soles absorb impact while walking in the sandals, which are breathable, non-slip, and waterproof so the can be worn anywhere. 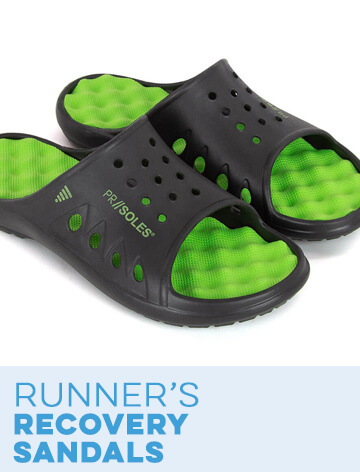 Runners love our recovery sandals, and many consider them an essential part of their running gear, as recovery is an important part of any runner’s training or post-race regimen. 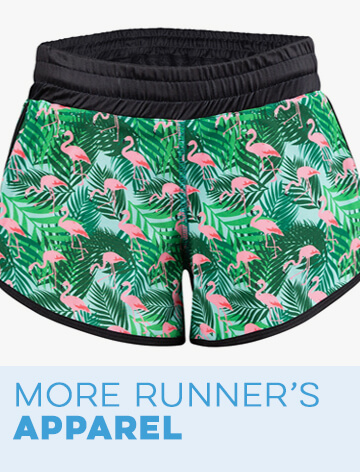 These great sandals are an excellent gift for a runner that they’ll be sure to wear all the time, and will love for the reduced recovery time they experience with regular use. Our running socks wick away moisture to keep runner’s feet dry and comfortable, no matter what style and length they prefer. Our running knee socks are stretchy, yet supportive, for a comfortable run. We also offer compression knee socks, which have graduated compression to improve a runner’s blood flow, and therefore, performance. 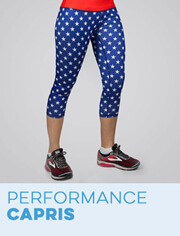 They still wick away moisture like our regular knee socks, but have the added benefits of compression that so many runners love. Our crew-length running socks (also known as mid-calf socks) wick away moisture and most styles are custom printed to order, so selected styles can be personalized with your own text or a name for a unique pair of runner’s socks - including a pair designed for a runner’s birthday for a special, one-of-a-kind running gift. 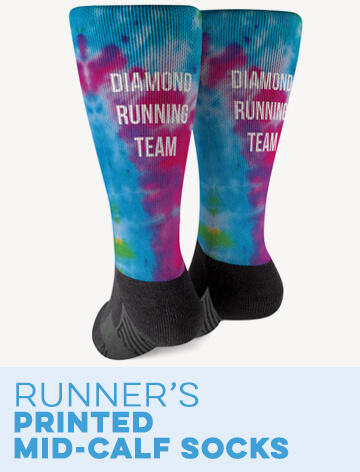 You can even choose a favorite race city or distance, or socks specifically for holidays, such as Christmas and Hanukkah or Halloween and St. Patrick’s Day - plus many more. 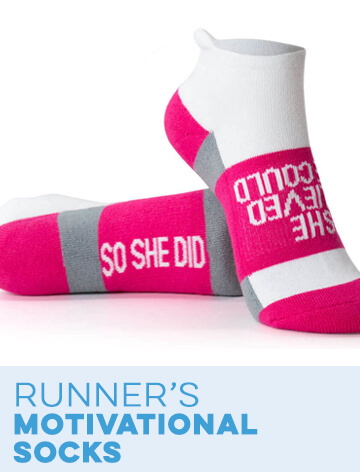 Our motivational running ankle socks have inspirational messages woven into the moisture-wicking socks to remind runners to always keep going and give it their all, and are available in single pairs as well as multi-packs. These socks are popular with runners who love the cushioning and arch support for a pair of socks that pads the contours of the feet for a near-perfect pair of running socks. 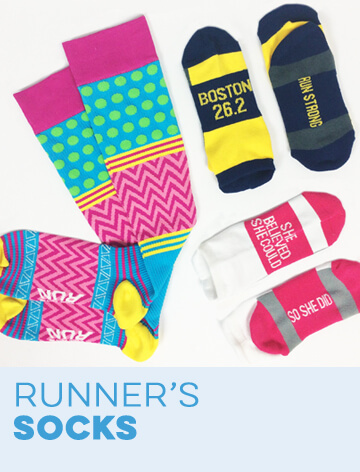 All of our running socks are sure to be favorites among runners and feel as great as they look with a wide variety of colors, patterns, and text - as well as customization options for a special gift for a runner in your life, or a way to bring a team or running club together when participating in a big race. Runners will love our wide array of runner’s sandals to choose from, ideal for any occasion. Our delicate and custom engraved thong sandals have original running designs, including race distances, as well as different styles of personalized monograms, as well as the choice to add your own text to commemorate a special race or to show support for a favorite runner in your life. The versatile sandals have silver straps, which help the engraving to really stand out, and are the perfect choice for casual wear, though they can be worn for more dressed up looks as well. Our runner’s slide sandals are lightweight and breathable with a unique cushioned footbed, and available in a selection of colors and designs - including custom printed designs featuring artwork and designs for an excellent running gift whether it’s to celebrate completing a specific race distance, or a race in a favorite city, or a holiday such as Halloween or Christmas. 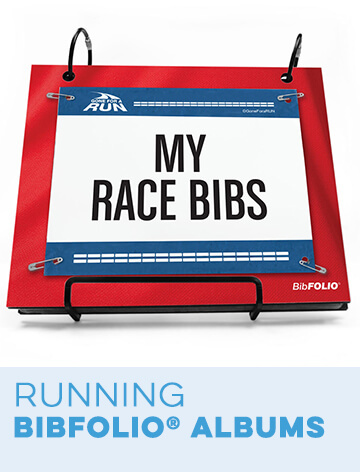 The artwork or text is printed on the VELCRO® strap that adjusts for the best fit every time, and a great pair of running slide sandals to slip on post-race or for any spring or summer activity. Our running flip flops are lightweight and waterproof, with a dense foam sole and soft textured footbed for all-day comfort, whether at the beach, pool, or walking around and relaxing with friends. While all of the running flip flops are boldly designed, selected styles can be personalized with a name, monogram, or other text of your choice for the ideal pair of running sandals. 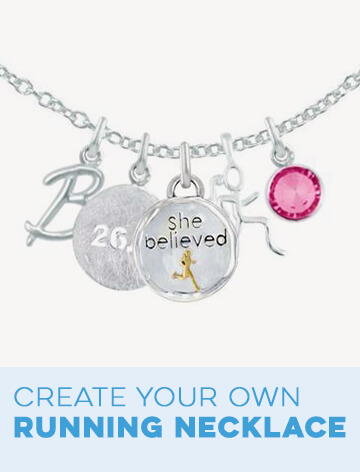 We have special designs for runner moms that are perfect for Mother’s Day, inspirational designs that are sure to be a favorite, as well as 26.2 and 13.1 designs that will really stand out and any proud runner will love to show off - and something ideal for any runner’s personal taste or style, as we have a huge selection of exclusive designs available in a wide variety of colors.